Our cars, with even mild modification, create some serious heat. As the turbo compresses your intake air, it heats up and it’s not unusual to see air temperatures of over 400˚F entering your intercooler. For that reason, you’ve probably upgraded to a larger, more capable top mount. That intercooler uses ambient air flowing over your hood and through your scoop to cool the hot compressed air and if you’re still using the OEM WRX size splitter, you’re not getting the most out of your TMIC. The GrimmSpeed line of splitters increases the size of the opening by 70% to your larger TMIC. STI or aftermarket TMICs can increase your internal core volume by as much as 200% and you’re going to need every bit of that additional ambient air to keep things cool. 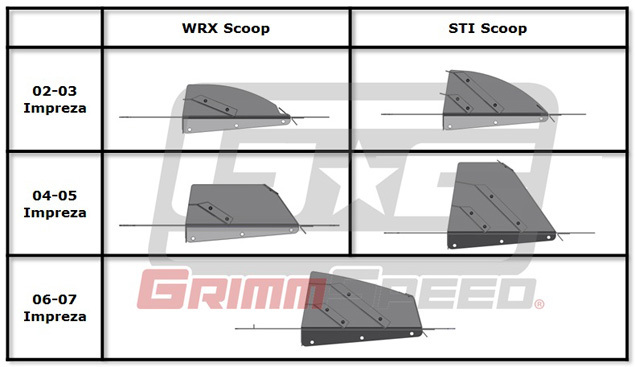 Each of these splitters has been designed to make the best possible use of the air entering your scoop and we offer a fitment for every 02-07 Impreza with a WRX or STI scoop. We’ve opened up the bottom of the splitter to better fit your STI or big aftermarket TMIC and we’ve redesigned the vanes that direct air from your scoop down to your intercooler. In addition, we’ve added features for up to three intercooler water sprayers to each splitter. Each splitter was designed in CAD and tested via flow simulation prior to production. Extra air diversion vanes were added to the splitters where there was space. Where there wasn’t space (due to a smaller scoop), vanes were re-designed to more evenly distribute airflow. You’ll also find that the GrimmSpeed splitters are very lightweight. We’ve tested some of ‘the other guys’ splitters and have found that they’ve chosen stainless steel instead of aluminum. The reason for this is likely as a band-aid, to ensure stiffness so that the splitter holds its shape. Instead of selecting a stiffer material, we’ve stiffened the design, which has allowed us to use 20 gauge 5052 aluminum and drop the weight of these splitters by 300% over the competition. Instead of welding the assemblies, we’ve opted to use flathead rivets. These offer the same mechanical joint but without stressing the material and because of that, you don’t have to worry about breaking welds or your splitter cracking. With each splitter, we’ll be including a length of a custom designed extrusion gasket, made from the same EPDM rubber as the OEM gasket, but better suited to fit our splitter. Pre-punched for split-shank rivets and molded with a 15˚ flare, you can be sure that you’ll get a great seal with no worries of failing adhesive or brittle rubber.